Scott's Web Log: The Business of Diabetes: Might Medtronic Acquire Bayer's Glucose Meter Business? The Business of Diabetes: Might Medtronic Acquire Bayer's Glucose Meter Business? 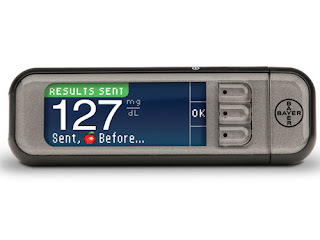 In case my readers hadn't already seen or heard the news, Medtronic Minimed's "The Loop" blog (see HERE) posted news last night about a new blood glucose meter being called the Contour Next Link, which was co-developed by Medtronic and Bayer. Medtronic has had some partnerships similar to this in the past, notably with industry market-share leader Johnson & Johnson's OneTouch product line. But aside from being the best-selling meter around, J&J OneTouch has hardly been a design innovator. Until the recent introduction of the OneTouch Verio IQ, which is supposed to recognize blood glucose patterns on behalf of the patient, their biggest innovation was designer colors for its meters (hot pink or neon green, anyone?). The Contour Next Link looks remarkably similar to the Contour USB meter. My readers may recall that several years ago, I switched to Bayer's Contour USB meter (see my post HERE), and I was so glad I did. 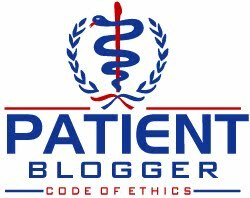 It made me realize just how lousy J&J's testing product line really was (I can't begin to recall how many tests were initiated before having a large enough blood sample, which pissed me off to no end, wasting my time and my insurance company's money for a seemingly simple issue to fix). Add to that, J&J's unprecedented numbers of product recalls (none that I'm aware of for the meter business) during the past few years made me glad to have dumped OneTouch far-less-than-Ultra. To be sure, the Bayer product wasn't perfect, but it was as good as J&J's was. I'm in the process of using my remaining test strip inventory, and since Bayer Contour is no longer on formulary, I'll be switching brands, although I don't think I had much to do with the decision. I'll address how I made a decision on which meter I'll be switching to in the future. Without getting too far off-topic, Mike Hoskins at DiabetesMine covered most of the technical details on the Contour Next Link meter (see HERE) far better than I'm equipped to, such as how the Contour Next Link meter will communicate with Medtronic insulin pumps, so I won't reiterate that here. However, the underlying business story is a tad more interesting in my humble opinion, at least from a business perspective. "Bayer has held talks with prospective buyers of its Diabetes Care unit, which has annual sales of about 1 billion euros ($1.3 billion), Financial Times Deutschland said in its Wednesday [May 9, 2012] edition, citing sources close to the possible suitors and in the financial industry. The paper said that Bayer declined to comment. (Reporting by Ludwig Burger; Editing by Ed Lane)"
That's pretty much the entire news story, but the message is that Bayer is shopping around for buyers for its self monitoring of blood glucose testing business. To be sure, nearly 4 months have passed since that story ran, but nothing further has come of it ... yet! However, after that story ran, the industry insiders at Café Pharma (an industry message board) were, as one might guess, busy chatting about it. One commenter noted they would not be surprised if Medtronic was among the list of potential buyers for that business (see http://goo.gl/KUM9q to read the postings), although others mentioned included Japan's Panasonic, which was rapidly dismissed by others on the message board. 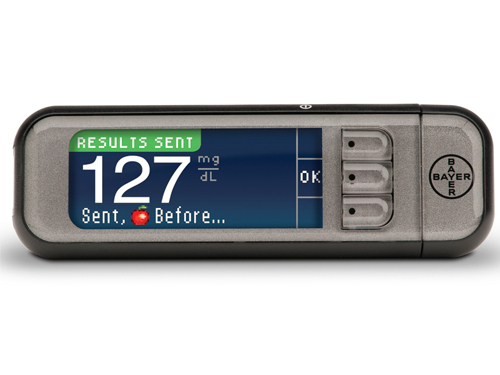 However, the possibility of Medtronic entering the self-monitoring blood glucose ("SMBG" in FDA parlance) market is quite compelling from a business perspective. To be sure, Bayer's product is OK and has some nice features, but like meter rivals Abbott and Sanofi, Bayer has struggled to get the product on insurance company formularies. To do that often requires big discounts to land an account, hence the margins are very tight, and the contracts are often multi-year deals, meaning an insurance company procurement agent may sign for a supply arrangement for anywhere from 3 to 5 years in advance. Continuity in the supply chain really doesn't mean very much when the impact to the bottom line can be billions of dollars! The two dominant players are J&J and Roche's Accu-Chek, which both have coverage by something like 85% of all insurance plans. Smaller players are forced to rely primarily on third-party distributors like CCS Medical which is a big supplier to Medicare patients to sell their products, as over-the-counter sales (for cash) represent a tiny (and declining) sliver of the overall market. Presently, no acquisition moves have been formally announced by any company. It is still conceivable that Bayer will examine potential offers and could still abandon the idea of a sale if it thinks the business has been under-valued. But a possibility of Medtronic, which is a medical device conglomerate is very alluring. It would fit well within the company's dominant insulin pump business, and having a meter that already "connects" to them is even more compelling. A key question is likely to be whether Medtronic has any appetite for such an aquisition? Not following the company closely, I really cannot say, but the price tag, even given Bayer's sales of $1.3 billion/year, could be relatively cheap, especially relative to what Medtronic paid for Minimed ($3.28 billion back in 2001), and it's no secret that the medical device giant has deep pockets. Indeed, Medtronic's Diabetes Care business, even though it is the market share leader in insulin pumps, is still a comparatively small piece of a much larger medical device company. But the pieces would fit together very nicely, and Medtronic wouldn't have to build it from sratch as they say. Plus, I find the possibility of Medtronic gaining broader coverage for Bayer's meters even more interesting. But right now, it's all speculation. Still, we're likely to hear something before too much longer (a seller won't keep a business up for bid indefinitely), but a good place to look would be at Bayer's Investor Relations web site (see http://www.investor.bayer.com/en/ as any news that the company has sold the business is almost certain to appear there first). Author P.S. (Oct 26, 2012): It appears Bayer's sale of the meter business isn't going to happen. Today, Reuters reports http://reut.rs/U0BuZw "Bayer AG has called off the sale of its blood glucose meters business for now, Financial Times Deutschland reported, citing industry and financial sources." The headlines about Bayer selling off its diabetes division surfaced again end of July. I believe it was rumored Sanofi was the interested party but it makes sense for Medtronic to buy it. It will resolve all their meter collaboration issues with partners going out of business or selling off the business. An interesting theory about Medtronic. I remember that article about Bayer selling off its diabetes division (which seemed unusual to me, since diabetes products are quite profitable, I thought). That article came about a month after another one saying Bayer planned to consolidate all of it's US operations to a single facility in Hanover Township, NJ and would close its other locations, including the one in my town (a few miles north of Hanover) and the one which housed its diabetes-care division in Tarrytown, NY. I wondered if the two announcements were related. Anyway, the announcement that I saw of the diabetes-care division came also contained the phrase "possibly to Johnson and Johnson". Medtronic's switch from J&J to Bayer meters, then, obviously seemed illogical as well. Something didn't seem right. But if Medtronic, not J&J, were the buyer, it would make sense. With total control of a meter's manufacturing, they might even develop a Ping-like remote-bolus interface. Bayer is a popular company here in my locality. The issue might just be good for the company.